Koopa Zappers are obstacles in Mario Kart Wii. 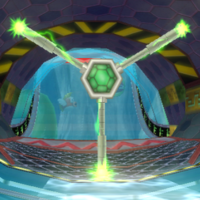 They are Koopa Shells with rotating electricity that appear in the underwater glass tunnel of Koopa Cape. Their electrical streams rotate around the tunnel, and if any racers come into contact with them, they slow down massively and shrink (as if they were hit by the Lightning item). The Koopa Zappers are not present in Mario Kart 7, despite Koopa Cape returning as a retro course; instead, Cheep Cheeps occasionally swim around in the tunnel. They work similar to electric Firebars. ↑ Hodgson, David S. J. Mario Kart Wii Premiere Edition. Page 33. This page was last edited on March 5, 2018, at 00:58.